The second-generation Motorola Moto X has been updated to Android 6.0 in India. Weighing in at 884MB, the update adds Doze, which puts your phone into a deep sleep state to increase standby time. This increases your battery life. Google Now on Tap brings contextual search to your handset. Whatever is on your screen becomes the subject of your Google Now search. And new app permissions allow you to approve or deny permissions on a feature-by-feature basis. 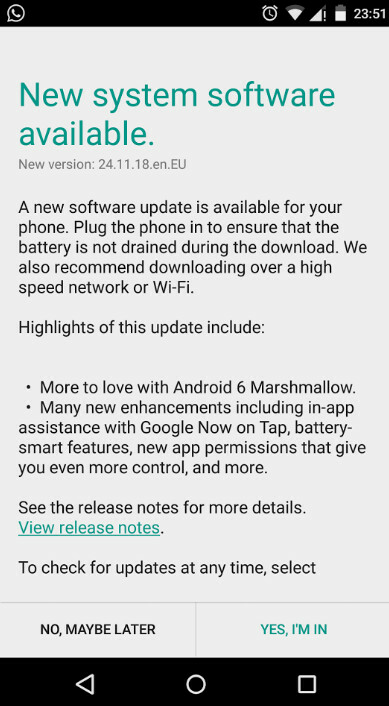 Motorola suggests that before the updating process begins, you connect your second-generation Moto X to a high-speed Wi-Fi network. It also recommends that the phone be plugged in to prevent the battery from draining during the update. Instead of plugging in the handset, you can elect instead to charge the battery to 75% or higher before starting the update. Android 6.0 will be available for the second-gen Moto X only in Asia, Canada, Latin America and Europe. In the U.S., only the unlocked second-generation Motorola Moto X Pure Edition will be updated to Android 6.0. I got one for 210$ 3 months ago for my dad. It's an awesome phone even on lollipop, can't wait to see marshmallow on it. By the way, it looks like the update hit Europe as well: in France, my 2014 Moto X got it yesterday. Can't wait to get my. I received the update yesterday. And updated it to Android M. But battery draining is more than usual today otherwise all the rest is awesome especially "Google now on tap"
how is the performance and battery life.